Wewlcome to the News 1971. What was in the Newspapers and periodicals in 1971. A five-day holiday in Majorca for two this winter... that is the first prize in a talent contest which has just got under way in a Glasgow hotel. In addition there are cash prizes for the second and third in the contest, which is being held on Thursday evenings in the Aquarius Room at the Charing Cross Hotel. The contest is open to all types of entertainers: in fact the more varied the better. Unfortunately, however, because of the time involved in setting up on stage, groups are excluded. However for fire-eaters, belly dancers, jugglers, comedians, or ventriloquists there is plenty of room on the stage. Billy Jeffreys, who fronts the popular Bards, is organsing, running, and compering the contest and promises that there will be a panel of expert judges for the final stages. Billy is resident in the Aquarius Room at the hotel every Thursday, Friday and Saturday, and lately he has been doing a drag act on the Saturday night shows. I haven't caught the drag bit yet, but I hear it is a lot of Fun. Anyone interested in going in for the contest should go along on Thursdays and give Billy a note of his name... and he will see to the rest. Come to think of it, for a winter week in Majorca I'm tempted to enter myself. The Ashfield Club, Possilpark, Glasgow. A flight at the Bier Keller, Union Street. Billy McNeill get a hotel Licence. Black Bull, Milngavie gets a face-lift at a cost of £140,000. 1971. Chase Inn, Langmuir Road, Kirkintilloch. Chrystal Bell's and the Queen's Theatre. Coach House, Bemersyde Ave, Hillside. Publican Gary Proccer is normally the mildest of men, with a ready smile and a word for everyone. But when I met Gary, who owns the Doublet in Fairley, which features some pretty good entertainment, and the Peel in Drumchapel, he was almost jumping with rage. With good reason. Rumours have been in circulation through out the city that both these premises have lost their licences because of under-age drinking and watered whisky. I had heard the stories myself and had dropped in to ask him about them "Absolute rubbish pure nonsense, and drivel," were some of the few quotes which I feel able to pass on. "I don't know how the rumours started or who started them. They are completely unfounded. In fact, I would go so far as to say that they are two of the best run places in Scotland. Recently, we ran a non-stop five hour variety show in the Doublet and have raised about a couple of hundred pounds for the Ibrox Disaster Fund. Please help me scotch these rumours, they are not doing my reputation one bit of good." Duke of Wellington, Argyle Street. Anyone got a pianola? Elgin Lounge, Sauchiehall Street. The Elgin Lounge in Sauchiehall Street, near Charing Cross, Glasgow, starts a six-nights-a-week cabaret scene on Monday. The comfortable fitted lounge will have cabaret from Monday till Saturday, and will normally feature two acts backed by the Alan Cameron Duo. Alan is the man who worked at the Ibrox Social Club before the recent fire. On the stage for the opening week are Kathleen and Alex Grant, and comedian Roy Jeffrys will be compere and do his own spot. Kathleen and Alex have done several television and radio shows, and recently finished a season at the Gaiety Theatre in Ayr. This summer they will be at the Whitehall Theatre in Dundee with comic Alec Finlay in his "Breath of Scotland" show. Ray is one of the most popular young entertainers on the Scottish club circuit, and has done several theatrical seasons. Glasgow Vintners, St. Patrick's Day. The Grafton lounge bar, Sandyford Place. Man Steals £800 from Heather Bar in Glasgow. Singer Matt McGowan, who has been out of the club circuit for over a year because of ill health, is now back in circulation again... and singing better than ever. For a bit of fun and to get the feel of singing in public again he entered a talent contest held in the Goldenhill in the Hardgate, and, as if I need say it, walked away with the first prize. Matt tells me - "The illness had left me a bit shaky, but I have been doing the occasional gig lately and feel that I would like to get fully back into the swing of things again. Honours Three, St. Andrew's Road. Jack Gow, chairman of the Scottish Licensed Trade Veto Defence Fund. Park Bar, Dalmuir hit by bomb. Pubs in Ibrox are not wanted. Queen's Bar, North Frederick Street. Ruxton's Bar is sold to the American's. The Tyrol Bar, Argyle Street. "A Gallon of Whisky, please, and have it sent round to-night." An order like this would be quite commonplace at the turn of the century, when the price of alcohol was so much less than it is today. 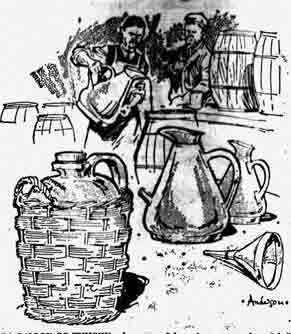 The spirit merchant would deliver the whisky in a handsome glazed stoneware jar cradled in a strong wicker basket. Usually the jar carried the trader's name and had a serial number imprinted on the top. After being emptied it was returned for refill or replacement. Stone jars of this shape are still made, but mainly for novelty or tourist trade and only in small sizes. The large old ones, when they can be found, make an interesting hall or kitchen decoration. Very decorative too are the large copper measures used in the "breaking down" of bulk whisky in the days before this was done by the blenders themselves. The merchant or publican took delivery of 105 deg. proof spirit in casks, which by law he was obliged to reduce with water to strict proportions. A range of copper jug measures of varying capacities were used, the largest of these, the four gallon, standing about 18in. high. In some public houses the reduction was done in the casks on the gantry, where there might be up to five different strengths of whisky available. William G. Lundie, president of the "BEN". Can you remember anything that happened in the 70s? then get in touch.